Wall Fountain Memorial stone facing - Universal Landscape, Inc.
Fountain Wall Memorial with stone facing is how to best describe this memorial feature project that was designed to create a quiet, garden place for both family to enjoy as well as a place for reflection. Designed to have a ‘rustic’ or Old World feel to it, as if it could have been built generations ago. The stone facing is made of both Georgia Sunset flagstone for the majority of the wall with the columns adorned with Tennessee Crab Orchard Flagstone. The center of the fountain wall memorial is a stone mosaic made from 2 different sizes of Mexican Buff Pebble stone to help add a visual contrast to the memorial wall & to help the fountain area itself stand out. The mosaic stone around the fountain piece of the lion’s head was chosen to both compliment the fountain piece lion’s head as well as the main memorial wall & yet, still stand out at the same time. 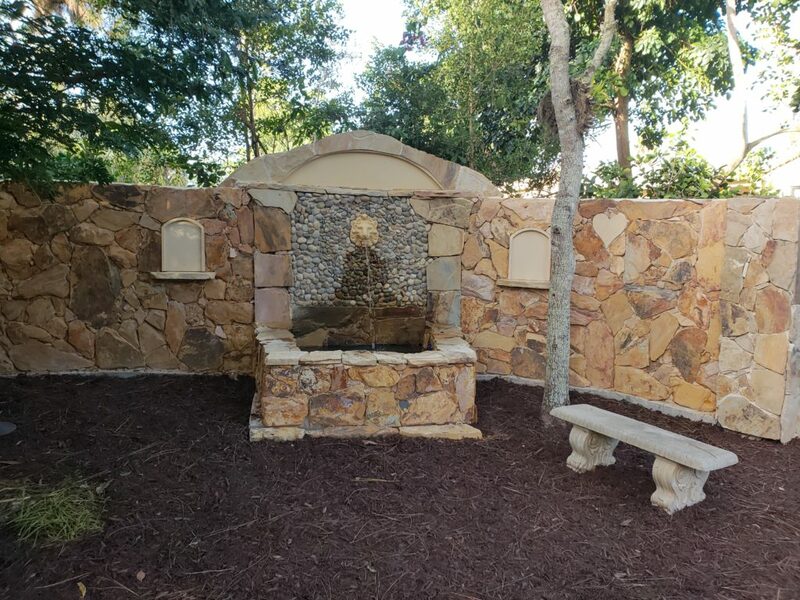 Above the fountain area mosaic is an arching custom made piece of cast masonry as well as 2 tablet shaped cast masonry pieces to help add visual interest to the entire fountain wall memorial. A concrete bench is at the front of the fountain pond facing a tree that was gifted years ago. For more information, please enjoy our website or feel free to call for an estimate.